Hi, (imagine head bowed in shame) my name is Vicki, it has been a long time since my last post. I confess, I have been on the other side of the performance machine for the last few months and too freaked out by the ridiculous creative goals I set for myself to check onto the blog-waves. 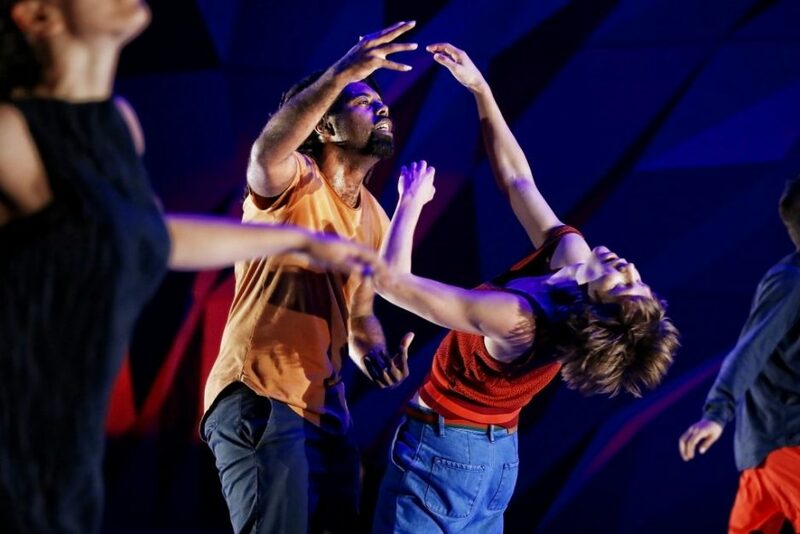 While I was submerged in my own artistic maelstrom I did take time out to see Le Dernier Appel, the latest offering from Marrugeku, presented at Carriageworks. Yes, it has been and gone a while back now but it burnt an indelible mark on my psyche, so I have decided to upload this post in hindsight anyway. There was a lot going on at all times in Le Dernier Appel as the dancers seemed to fill every inch of the available floor space at the frenetic pace of a Trojan virus infiltrating the web. (Are they still called Trojan viruses?) All of the artistic components seemed to reinforce the notion of deconstruction. We, as audience members, were able to view every part of an oft times complex and confusing whole; from the busy movement sequences, which consisted of a steadily augmented series of gestural isolations punctuated by hip hop style pops and locks and short doubled shifts in direction, to Nicolas Molé’s set with a backdrop which appeared like the kaleidoscopic jagged facets of a cliff face. A rotating flat screen video monitor dominated what was otherwise a relatively spare stage space, punctuated by two other ambiguous indoor/outdoor sculpturesque set pieces. Placed centre-stage, the monitor spewed forth an ongoing stream of video information regarding an uncertain future for the indigenous populations of both Australia and New Caledonia. Its flipside functioned as a mirror. Combined with Matt Marshall’s lighting, the screen was utilised to replicate and amplify the visual congestion. The frequently dire subject matter tackled the uncertain future of an indigenous presence in a post colonialist reality, conveying a clear message of oscillating resistance and futility, through the strength and relentless pace of the dancers’ physicality. I could speak about each dancer and their individual skillset. The indomitable commitment of Miranda Wheen, if bottled could easily go for six figures at an auction – she is that mesmerising. Dalisa Pigrim’s idiosyncratic movement vocabulary, seen in duplicate and triplicate, tastes like chocolate for the eyes. The unison work of the three New Caledonian dancer/collaborators, Yoan Ouchot, Krylin Nguyen and Stanley Nalo, featured snippets of their ‘traditional’ vocabularies and fostered a deep sense of cultural possessive pride within me. There existed in this work an uppermost urgency in the delivery of the message which took precedence above all else. The stage space was so obviously a platform to speak in the otherwise political arena where these/our voices are so often muted. It is this circumvention of the theatrical space for another purpose that rendered any value judgement I might make on its entertainment value redundant. P.S. To my erstwhile readers I apologise for my absence and pledge a more than usually steady stream of written responses to the incredibly diverse creative endeavours of our city’s dance artists to come.